Wurts Brothers. 16-18 West 36th Street Building. c. 1920. Courtesy of Museum of the City of New York. Reform laws aimed at protecting lives as well as property were one of the results of the 1911 Triangle Fire. A new generation of lofts appeared with safety features mandated. Wood was banned from all interiors, sprinkler systems and fire drills were mandated, and fire alarms and fire stairs improved. Sanitation, light, and ventilation were also enhanced. 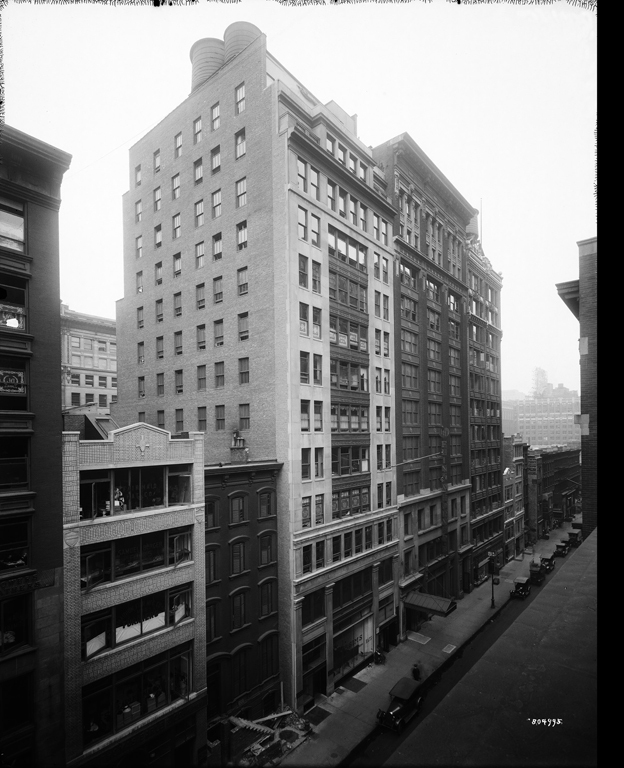 Scores of new lofts incorporating these reforms were erected, extending up Broadway and its side streets from Union Square to 23rd Street, then farther north beyond 34th Street. Although hardly luxurious, these new loft factories were, at a minimum, safe places to work. The new loft buildings created uniform blockfronts of 10- to 12-story buildings with 2- or 3-story stone bases and ground-floor shopfronts. The facades were often articulated by large window openings with fireproof, metal-frame pivot sash that could be swung open for ventilation. Most were steel-framed structures with fireproof concrete floors. Each building could house dozens of industrial tenants. Many lofts were erected near the elegant department and specialty stores on Broadway, where the factories would be close to their customer base. However, congestion caused by male workers on Broadway during their noon lunch breaks concerned the store owners, who blamed them for a decline in sales. As a result of this congestion, the stores began relocating to Fifth Avenue north of 34th Street in the early years of the 20th century, only to find that the loft builders followed them to this area, resulting in a confrontation that would change the character of the garment industry and its factories. NEXT: SHALL WE SAVE NEW YORK?